quantity fills a 13 to 15 lb turkey. 15 oz stuffing mix/cubed bread crumbs 16 oz appx. Giblets-If stuffing into a bird, check the cavity and neck of the bird for giblets and neck. Add plenty of water since much will be lost during the cooking time. In this recipe we added about 4 cups to end up with 2 to 3 cups of stock. If necessary, add more water while cooking. Once the giblets are simmering, chop the celery, parsley, onions, garlic,and rosemary. Get the butter melting and the sausage browning. Add the celery mixture to the butter and sausage, and cook (on low) until parsley mixture is slightly tender. It will have plenty of time to finish cooking in the turkey or baking dish. 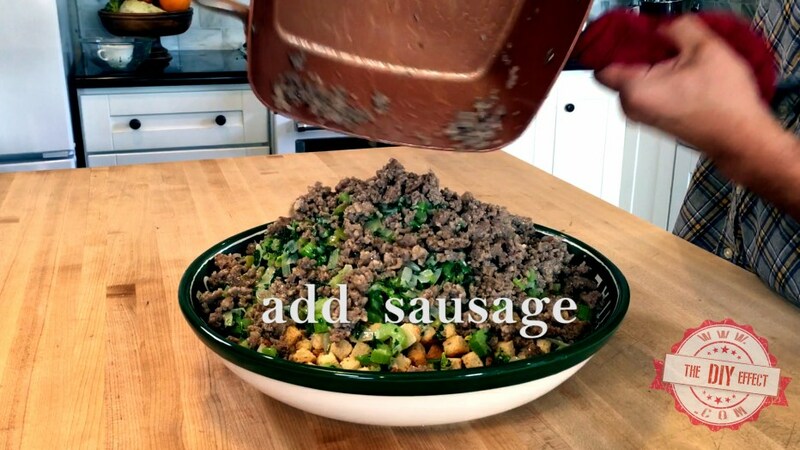 Combine the bread crumbs/stuffing mix, celery mixture, browned sausage, green chiles, eggs,and all the other ingredients into a big bowl and mix. Slowly add the giblet water/stock to the mixture. Start with a cup, then half cup and continue with small amounts until you get the moisture the way you like it. Going for moist, not soggy so don’t overdue the liquid. Add just enough to form a small ball that barely holds together. Stuff the cavity and neck of the turkey, or use a baking dish. We had a little extra stuffing that would not fit in this 13lb turkey, so we baked it separately and when all done, combined it with the stuffing that was cooked in the turkey. Note on green chiles: The canned green chiles are the most unique part of this recipe. Don’t be afraid to try it. As long as you don’t use the liquid from the can or use hot instead of mild, you’ll hardly know the difference. 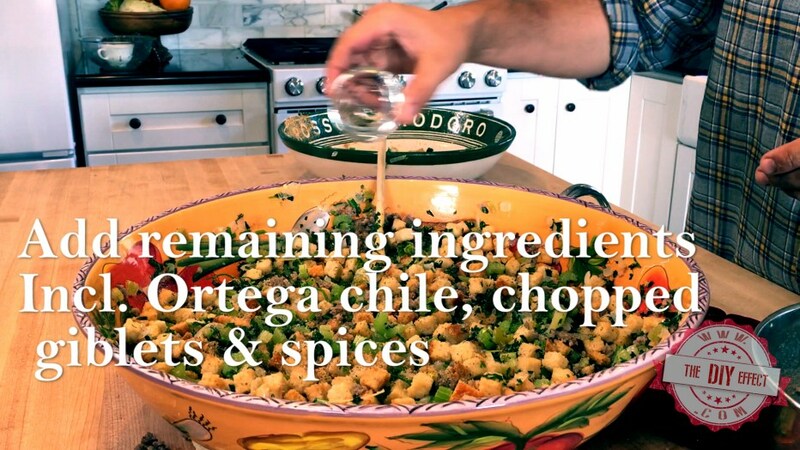 The chiles give the stuffing a rich flavorful taste. For a spicy stuffing, you could use the hot canned green chiles. Note on seasoning: If the bread crumbs come with a seasoning packet, then some of the ingredients here could be eliminated. Also, poultry season has many of these ingredients, such as tyme, sage, and rosemary. Mostly fresh ingredients were used in this recipe, but all these options work beautifully. Vegetarians: Bake the stuffing in a baking dish instead of a turkey. 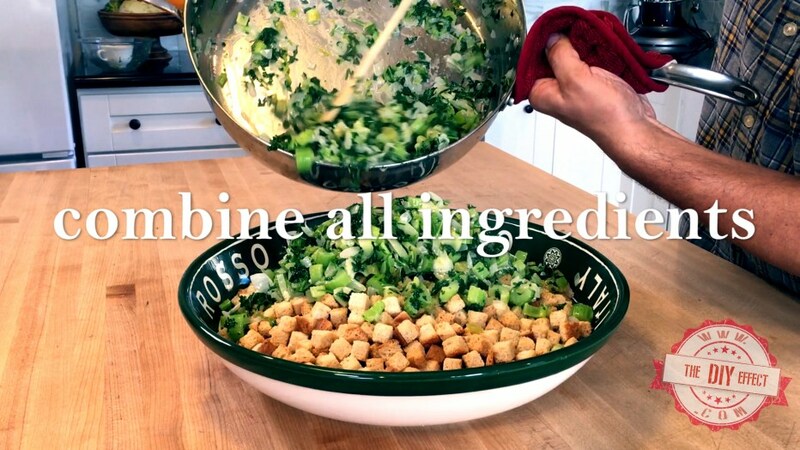 Exclude the giblets and sausage, and replace the giblet water with vegetable stock. Gluten Free-Replace the bread crumbs with gluten free bread crumbs or make your own bread crumbs out of gluten free bread.